Home / cover / Frank Sinatra / Live performance / Maris / música / video / 17-yo covers Sinatra in her kitchen and it just might make your day! 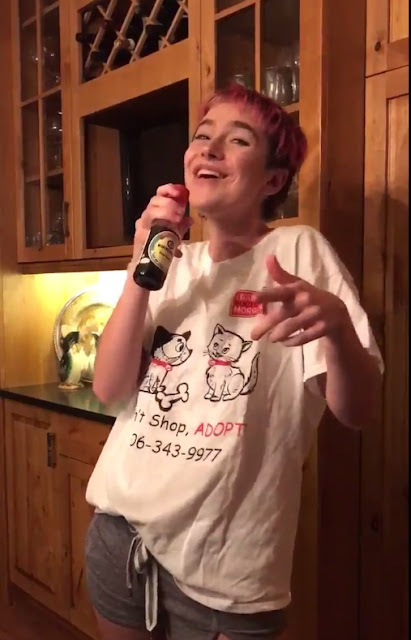 17-yo covers Sinatra in her kitchen and it just might make your day! While preparing for a local gig, singer/songwriter Maris and her mother Dawn were going through some song options, when her mom suggested Fly Me To The Moon, the Frank Sinatra's classic. The rest is internet history. In less than 24 hours, a playful performance of Maris singing the song in her mother’s kitchen went viral with over 47K retweets, 150K likes, and adding so many comments it crashed Maris’ cell phone. Even Kikkoman Soy Sauce, the bottle Maris happened to grab to use as her microphone got into the act tweeting about the video which you can watch below! At last check the Twitter storm is continuing with the numbers growing in a few hours to 164K likes and Maris’ twitter following doubling. While you are being entertained by this charming and smart 1:34 seconds bunches of fun, check out this song prodigy’s music and fall even further in love with her ability to sing, write and perform. Prior to the online explosion of Fly Me To The Moon, Maris who hails from Missoula Montana, has already released two albums and recorded a version of Dolly Parton's classic song "Jolene," which has just passed a half a million views on YouTube as part of Scott Bradlee's Post Modern Jukebox. More recently Maris was awarded first place in the category Guitar/Vocals in American Protege's International Music Talent Competition which will earn her a performance December 16th at New York's illustrious Carnegie Hall.